If you’re looking for a great career, Tulsa Welding School offers training as an electrician in our new Electrical Applications program as well as training as a welder with program options such as Professional Welder, Welding Specialist and Welding Specialist with Pipefitting. But what career path is right for you? Both options offer promising job opportunities. Here are some considerations when deciding on which program to choose. Welding training can take as little as seven months to complete. You only have one day a week in the classroom; the rest of the time is spent hands-on using the welding equipment that you would on the job. The new electrical applications program in Jacksonville will also only take seven months to complete. While both programs offer extensive hands-on training, there are more lecture hours for electrical applications than for some of the welding programs. Becoming a welder can offer a rewarding career path. Welding inspector training followed by certification can show employers that a professional organization has approved a welder’s skills to meet industry standards, which may increase your access to job opportunities and better pay. The Bureau of Labor Statistics (BLS) 1 outlines some certifications available to welders, such as Certified Welder, Certified Welding Inspector and Certified Robotic Arc Welding, all of which can be obtained through the American Welding Society. In order to obtain electrician jobs, most states require that you be licensed and that you pass a test for that license, indicates the BLS 2. Tests and regulations vary from state to state, so it’s extremely important to learn what’s required so you can obtain a license. Contacting your state electrician licensing board is a good start. You are likely to be tested on local electrical codes, state electrical codes and the National Electrical Code. The BLS offers salary information for both electrician jobs and welder jobs. In 2012, the median pay for a welder was $36,300 per year. The outlook for growth in welding through 2022 is about 6 percent. Comparatively, electrician jobs are expected to grow 20 percent. The median pay for electricians in 2012 was $49,840 per year. The BLS expects electrician jobs to increase by 114,700, whereas they expect welding jobs to increase by 20,800. The top 10 percent of electrician wage earners pulled in more than $82,930 a year. Compare that to the top 10 percent of welder wage earners who earned more than $56,130 a year. What sort of work environment can you expect if you’re a welder versus an electrician? Both electricians and welders may work indoors or outdoors. Both may have to deal with cramped working environments. Many are expected to work overtime, sometimes cutting into evenings and weekends. In 2012, about 61 percent of welders were employed in manufacturing, and 11 percent were employed in construction. Welders also found jobs in non-public-administration service sectors (5 percent) and wholesale trade (5 percent). Electrician jobs can be found in electrical contractors and other wiring installation contractors industries, which employed about 61 percent in 2012. You can be an independent electrician; about 9 percent of electricians were self-employed. Welders naturally work with welding equipment. You may use gas tungsten arc welding, gas metal arc welding, flux-cored arc welding, plasma arc welding, shielded metal arc welding, resistance welding and submerged arc welding. You may use grinders, solderers, heated cutting equipment and other tools for manipulating metal. You’ll have to have safety equipment such as masks with protective lenses, heat-resistant gloves, safety shoes, goggles, and other equipment to prevent burns and eye injuries. 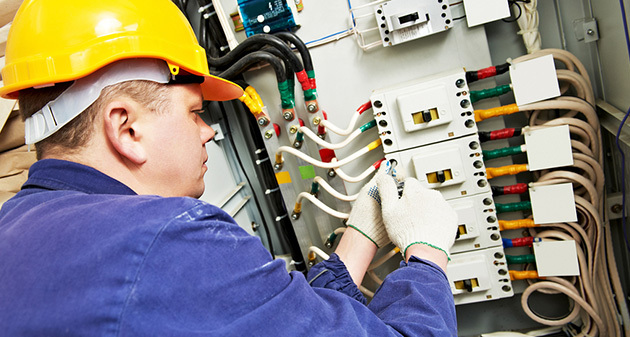 Electrical jobs require that you work with electricity and consequently the wires that carry the electricity. You’ll most likely have to read blueprints of wiring. You may also use ammeters, harmonics testers and voltmeters, among other equipment. You may have a toolbox with screwdrivers, conduit benders, pliers, saws, knives, wire strippers, drills and saws. As you can see, becoming an electrician or a welder can offer lucrative career paths. Whichever one you choose to work in will likely serve you well for many years down the road. Tulsa Welding School (TWS) offers training in both fields, as well as financial aid and extensive student and career services, to help you get started. Contact TWS today to learn more about which program is best for you.